Since terrorists attacked the United States on Sept. 11, 2001, victims’ loved ones, injured survivors, and members of the media have all tried without much success to discover the true nature of the relationship between the 19 hijackers — 15 of them Saudi nationals — and the Saudi Arabian government. Many news organizations reported that some of the terrorists were linked to the Saudi royals and that they even may have received financial support from them as well as from several mysterious, moneyed Saudi men living in San Diego. Saudi Arabia has repeatedly denied any connection, and neither President George W. Bush nor President Obama has been forthcoming on this issue. The public may soon also get to see these secret documents. 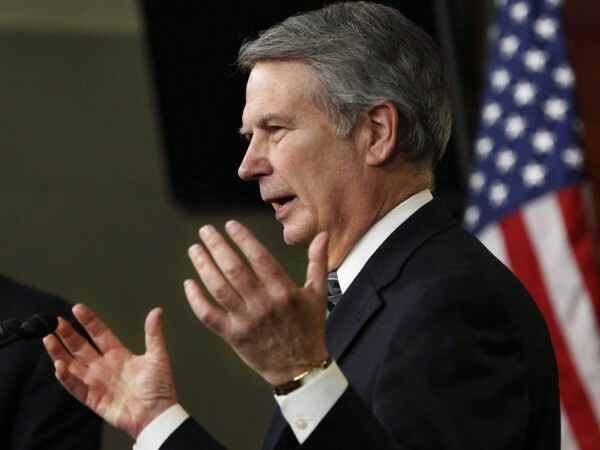 Last week, Jones and Lynch introduced a resolution that urges President Obama to declassify the 28 pages, which were originally classified by President George W. Bush. It has never been fully explained why the pages were blacked out, but President Bush stated in 2003 that releasing the pages would violate national security. While neither Jones nor Lynch would say just what is in the document, some of the information has leaked out over the years. A multitude of sources tell IBTimes, and numerous press reports over the years in Newsweek, the New York Times, CBS News and other media confirm, that the 28 pages in fact clearly portray that the Saudi government had at the very least an indirect role in supporting the terrorists responsible for the 9/11 attack. In addition, these classified pages clarify somewhat the links between the hijackers and at least one Saudi government worker living in San Diego. Former Sen. Bob Graham, D-Fla., who chaired the Joint Inquiry in 2002 and has been beating the drum for more disclosure about 9/11 since then, has never understood why the 28 pages were redacted. Jones insists that releasing the 28 secret pages would not violate national security. It took Jones six weeks and several letters to the House Intelligence Committee before the classified pages from the 9/11 report were made available to him. Jones was so stunned by what he saw that he approached Rep. Lynch, asking him to look at the 28 pages as well. He knew that Lynch would be astonished by the contents of the documents and perhaps would join in a bipartisan effort to declassify the papers. 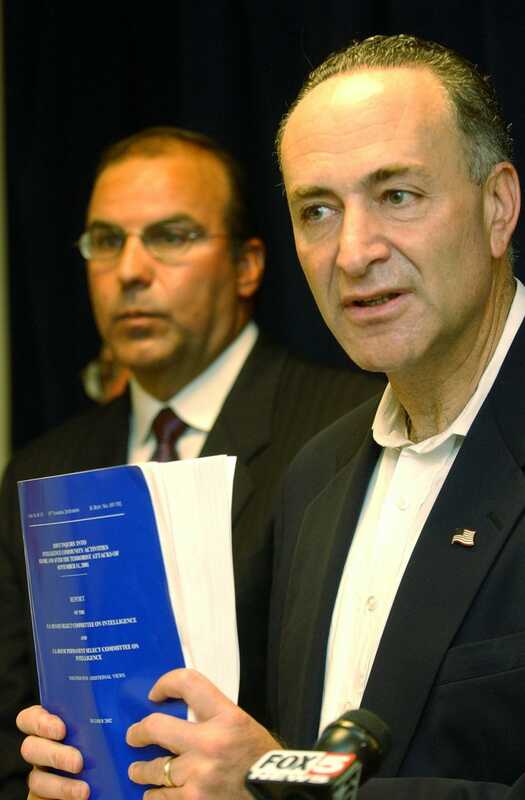 Sen. Charles Schumer, D-N.Y., right, is flanked by John D’Amato, an attorney for the victims of the Sept. 11, 2001 attacks, as he faces reporters in New York, Sunday, July 27, 2003, with a copy of the government report on the attacks. Schumer urged President Bush to use his influence with the Saudi royal family to have Omar al-Bayoumi brought here to provide more information on his relationship with the terrorists. A decade ago, 46 senators, led by Sen. Charles Schumer, D-N.Y., demanded in a letter to President Bush that he declassify the 28 pages. The letter read, in part, “It has been widely reported in the press that the foreign sources referred to in this portion of the Joint Inquiry analysis reside primarily in Saudi Arabia. As a result, the decision to classify this information sends the wrong message to the American people about our nation’s antiterror effort and makes it seem as if there will be no penalty for foreign abettors of the hijackers. All of the senators who signed that letter but one, Sen. Sam Brownback (R-Kansas), were Democrats. Lynch, who won the Democratic primary for his congressional seat on that fateful day of Sept. 11, 2001, told IBTimes that he and Jones are in the process of writing a “Dear Colleague” letter calling on all House members to read the 28 pages and join their effort. Most of the allegations of links between the Saudi government and the 9/11 hijackers revolve around two enigmatic Saudi men who lived in San Diego: Omar al-Bayoumi and Osama Basnan, both of whom have long since left the United States. In early 2000, al-Bayoumi, who had previously worked for the Saudi government in civil aviation (a part of the Saudi defense department), invited two of the hijackers, Khalid Almihdhar and Nawaf Alhazmi, to San Diego from Los Angeles. He told authorities he met the two men by chance when he sat next to them at a restaurant. 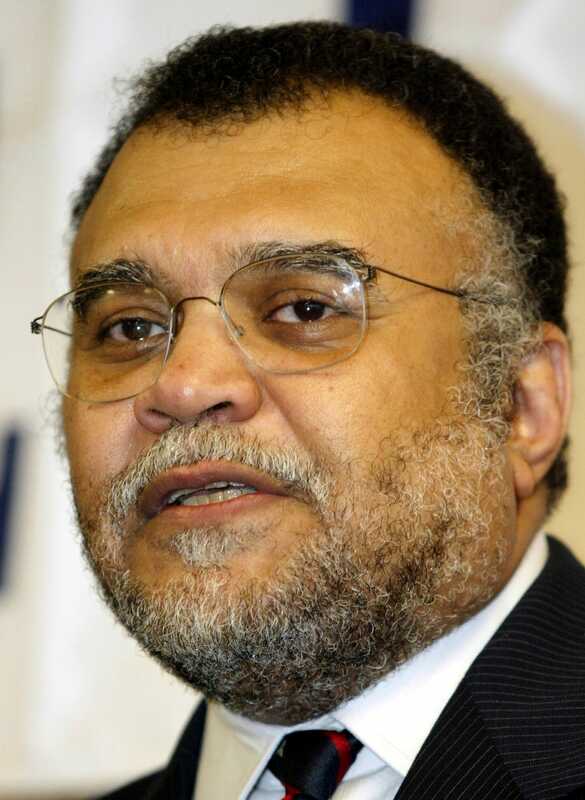 Newsweek reported in 2002 that al-Bayoumi’s invitation was extended on the same day that he visited the Saudi Consulate in Los Angeles for a private meeting. Al-Bayoumi arranged for the two future hijackers to live in an apartment and paid $1,500 to cover their first two months of rent. Al-Bayoumi was briefly interviewed in Britain but was never brought back to the United States for questioning. As for Basnan, Newsweek reported that he received monthly checks for several years totaling as much as $73,000 from the Saudi ambassador to the United States, Prince Bandar, and his wife, Princess Haifa Faisal. Although the checks were sent to pay for thyroid surgery for Basnan’s wife, Majeda Dweikat, Dweikat signed many of the checks over to al-Bayoumi’s wife, Manal Bajadr. This money allegedly made its way into the hands of hijackers, according to the 9/11 report. Despite all this, Basnan was ultimately allowed to return to Saudi Arabia, and Dweikat was deported to Jordan. Sources and numerous press reports also suggest that the 28 pages include more information about Abdussattar Shaikh, an FBI asset in San Diego who Newsweek reported was friends with al-Bayoumi and invited two of the San Diego-based hijackers to live in his house. Shaikh was not allowed by the FBI or the Bush administration to testify before the 9/11 Commission or the JICI. Graham notes that there was a significant 9/11 investigation in Sarasota, Fla., which also suggests a connection between the hijackers and the Saudi government that most Americans don’t know about. The investigation, which occurred in 2002, focused on Saudi millionaire Abdulaziz al-Hijji and his wife, Anoud, whose upscale home was owned by Anoud al-Hijji’s father, Esam Ghazzawi, an adviser to Prince Fahd bin Salman bin Abdulaziz al-Saud, the nephew of Saudi King Fahd. The al-Hijji family reportedly moved out of their Sarasota house and left the country abruptly in the weeks before 9/11, leaving behind three luxury cars and personal belongings including clothing, furniture and fresh food. They also left the swimming-pool water circulating. Numerous news reports in Florida have said that the gated community’s visitor logs and photos of license tags showed that vehicles driven by several of the future 9/11 hijackers had visited the al-Hijji home. Lynch said he didn’t know how the Obama administration would respond to the congressional resolution urging declassification, if it passes the House and Senate. Obama administration officials declined to comment on the congressional resolution or on the classification of these documents. The 9/11 Families United for Justice Against Terrorism (JASTA), an activist group comprised of the attack victims, has been calling for the declassification of the 28 pages for more than a decade. The group plans to contact Sen. Dianne Feinstein, D-Calif., chair of the Senate Intelligence Committee, this week to urge her to introduce a similar resolution in the Senate. Premoli said it was a “miracle” that she survived 9/11. “I found myself buried under dust and on top of a dead body,” she said. “It makes me angry that I still don’t know what happened or who was supporting these hijackers. The veil of secrecy must be lifted for the families, the survivors and for the American people. NextWhat’s The Truth Behind Climate Change?